The beginning of 2019 was a really busy time for us, with every office working hard on local events – including our Chinese team, who created something truly unique. 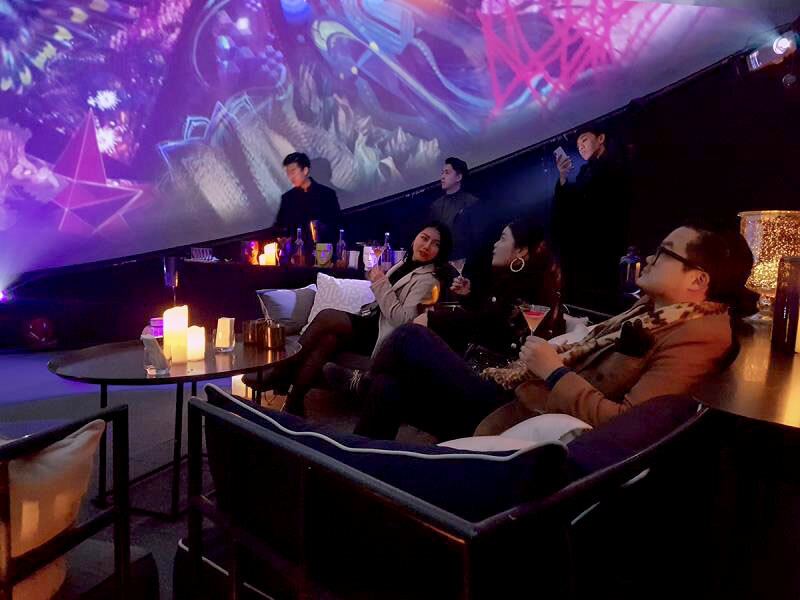 From Friday-Sunday during the period from December 28 to January 27, the dome on the rooftop of the W Hotel in Shanghai was transformed into a special space for an immersive cocktail party. In partnership with Woo Bar, the Vivien marketing agency created a unique format for the show. During the event, Fulldome’s Samskara show was projected onto the interior of the dome and guests were served with special cocktails, themed according to what they were watching at that moment on the screen. 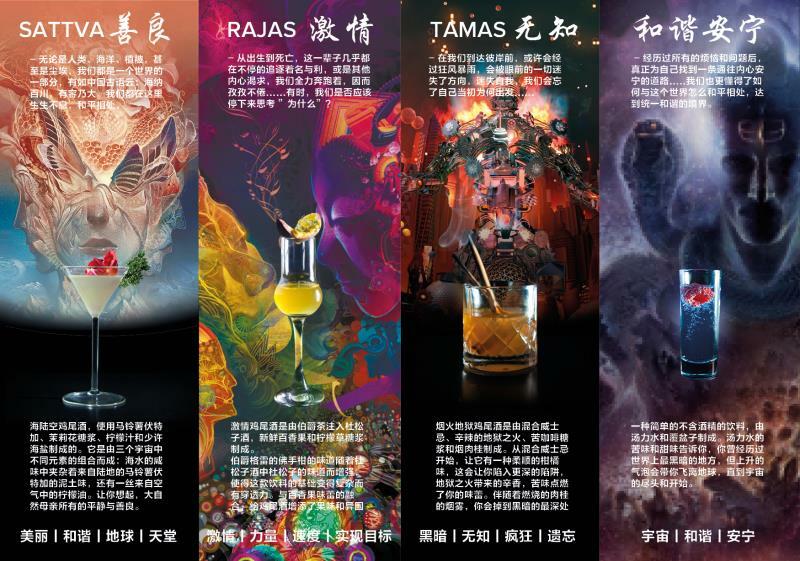 Dylan Iam, a talented barman and mixologist from Hong Kong, created cocktails with the taste of the energies shown in the Samskara show. Description: The three traits (Gunas) of Goodness (Sattva), Passion (Rajas), and Ignorance (Tamas) represent the mental qualities of clarity, distraction, and dullness. Each person has distinctive proportions of these three energies, which constitute their unique personality and tendencies. Made with potato vodka, jasmine syrup, lemon oil and a dash of sea salt, Sea, Land & Air is a combination of elements from three different worlds. The saltiness of the sea combines with the earthy taste of the potato vodka and an airy touch of lemon oil, a reminder of all the tranquility and goodness of Mother Nature. Description: Whether human, earth, ocean, river, lake or even dust, we are all part of a world, a world of great tolerance. We all live and breathe here, and we live in peace. First Kiss is made from gin infused with Earl Grey tea, fresh passion fruit and lemongrass syrup. The taste of bergamot tea, enhanced with the flavour of juniper berries from the gin, makes the base of this drink complex yet subtle. The addition of passion fruit gives the cocktail both tartness and an exotic fruitiness that reminds you of falling in love with someone for the first time, of the unforgettable taste of another’s lips. It’s sweet, fruity and too wonderful for words. Description: From the cradle to the grave, we are in a constant race for fame, profit, or other desires. We run with all our strength, never tiring of the chase, but at some point shouldn’t we stop to ask ourselves why? Smoke, Fire & Hell is made with blended whiskey, spicy Bittermens Hellfire bitter, coffee syrup, and cinnamon smoke. The smooth citrus taste of the blended whiskey will draw you in before the spiciness of the Hellfire bitter ignites your taste buds. The smoke of burnt cinnamon will complete your fall into the depths of darkness. This simple nonalcoholic beverage is made with tonic water and raspberry. The bittersweet taste of the tonic water is a reminder that you have passed though the world’s darkest places but the rising bubbles will take you high above earth and out into the universe – and a new beginning.